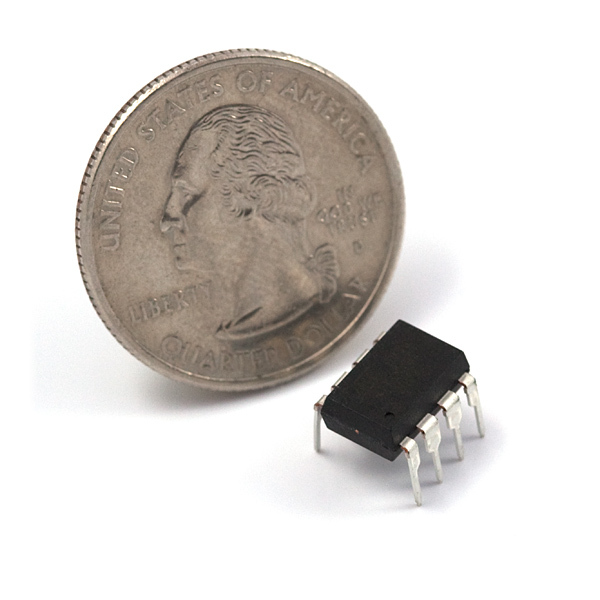 Atmel's itty-bitty ATtiny85 8-Bit Processor. 8K of program space, 6 I/O lines, and 4-channel 10 bit ADC. Runs up to 20MHz with external crystal. Package can be programmed in circuit. The actual manufacture part number is ATTINY85-20PU . It always tends to look like a lot of part numbers, but often it boils down to tape and reel vs tray, temperature ratings, and packaging. Sometimes you will even get different part numbers based on the default configuration (running at the full 20MHz, running at 1/2 clock speed at 10MHz, or using an external crystal for example), even though the actual chip is the same. For their naming convention usually you can find that in the ordering information at the bottom of the datasheet. Thanks a lot for your time and response! ATtiny85 w/arduino bootloader, 500ma voltage reg, and usb plug, on a quarter sized board (0.69x0.75(17.5x19mm)-usb) I don't see a crystal, so I assume they are using the internal clock. Some shields are also available. They can't use a crystal because they use the USB (both use pins 2 and 3).. So some of what i'd have used them for.. I can't due to the lack of crystal capability. (believe me.. you realize just how out of spec the internal oscillator/pll are, when you're trying to hit an exact output frequency, and it's far enough out of spec that what you're talking to, ignores you. Those are neat. Hopefully SparkFun will carry them. nice little chip. im still not sure what to use it for. probably could use it as some kind of servo channel mixer, or anywhere where i need to convert one type of a signal into another. shortage of pins kinda limits the possibilities. i really wish sf would stock the tiny84 though, which has twice the usable pins, yet still being small enough for those tiny projects. sometimes i use a mega328 and consider it a waste of functionality and the 2313 has too little flash. but the tiny84 would be a perfect addition to the inventory. especially since i have had a hard time finding a supplier which would ship to ak at a sane rate. Any chance of you guys at Sparkfun selling this with the bootloader? Does anyone know how much current you can source from the output pins? I couldn't find it in the datasheet. I'm trying to control a strip of a single Neopixel with an Attiny85 @ 16Mhz (internal PLL, 4.3 V BOD) but it just doesn't work. the example "strandtest" just makes the led stuck in green, any help? i'm just connecting the data cable of the neopixel to the Pin 7 (PB2) in the Attiny, i also try putting a resistor in this, but it doesn't help. Check out TCWorld's Attiny cores. He has SPI, I2C, and (soft)serial functioning. He also has a stripped down optiboot boot loader that tunes the oscillator and allow you to upload sketches over serial (allowing you to regain the reset pin as an extra I/O!). I tried a lot of cores and these are my favorite. Can these be set to operate at 8 Mhz instead of 20? Yep! The ATtiny85 ships with a fuse that makes them operate at internal 1MHz. That fuse can be changed to operate at 8MHz internal. If you need to go above that (or need better precision than the internal oscillator) you can set the fuses to operate with an external oscillator. 20MHz is the maximum external oscillator allowed. I'm not sure why but, I can't seem to find the output voltage per I/O pin, not including reset... can anyone help with this? In this case, with Vcc at 5V, the maximum low level is 0.6V, and the minimum high level is 4.3V. We ship to India, but you may also want to consider checking our our Distributors page for a more local shop. So how many of these would I need to chain together to use as a Minecraft server...? So does this actually have 6 I/O pins when you get it or do you have to reconfigure the reset pin or something? Where can i get a High Voltage Programmer to restore the fuse? I honestly wouldn't know - I've never needed one :) If you need more I/O it might be worth it to go for the models that offer that without shenanigans. A quick googling about shows that you can get a dev kit from ATmel that'll do HV programming (STK500), you can build your own (quite a few designs out there, mostly based on the dev kit), or you can eat the cost of the ATtiny and contribute to the landfills by tossing it and just programming another one (a popular option, apparently, but what a waste). Hi all. Anyone know if it's possible to use with a nordic radio? Is there any serial pirt on it? Here's a nice project with the previous version of this chip (AtTiny13) that shows how versatile and easty to work it is ! It basically uses 3 different interrupts plus ADC (the attiny13 only has 1 ) and a simple digital output ! Site flagged as a Blackhat SEO Exploit by AVG. Do not click. Looks like AVG is mostly tripping over a bunch of spam that's in a normally-hidden DIV. While it raises questions of how that spam got there, I think it would be safe to click - especially with scripting etc. disabled, or right-click, save as, and open the file as text in e.g. notepad, as it's mostly text instructions. I bet I'll get slapped for this, but I'll ask anyway. I am looking for suggestions on what power regulator I should use for this little guy when powering it from a 9v battery? I was thinking of using a Low Dropout Regulator 5 Volt 0.05A 3-Pin TO-92 Box from Jamco but I dont know if that little package will provide the correct output ourrent. How accurate is the internal resonator in these things? I've read that I can use an external crystal, and SparkFun sells them at +/- 50ppm stability, can I match that with the internal resonator? I built a programmer for it, using the arduino proto shield. Makes my life a lot easier. Does this have 3 PWM outputs? This post says this can be clocked at up to 20 Mhz. Could I clock this at 16 to not screw up timing with my Arduino code? Thank you! Now I need one of these more! Hi all! I've recently bought two of these Attiny85 chips. I followed the MIT hi-low tech-group instructions on using Arduino as an ISP to program the chips. I've triple checked my connections and poked around online for about three hours last night to no avail .. One common theory seems to be that the Attinys bootloader is fried/not the correct one. I'm stumped. I reverted to the old Arduino 0022 instructions and board definitions and everything worked again. I think the new instructions are just incomplete or something. Do these have analog imputs? And if so, how many? They have 4 10-bit ADCs. Take a look at the DS for more info. So I could have 3 PWM channels and 3 analog imputs? You can use all six pins but once you reconfigure the 'reset' pin as I/O you can't update the software without a special programmer. You get 4 PWM pins and 4 ADCs, but they are not related in ANY way. Look @ the DS. So, as I understand, one can program this, correct? What do I need to do that? You'll need a programmer like the this and some sort of AVR programming toolchain. Google programming avr or attiny and that should give you a start, but as of right now there's no one best resource. There's an incomplete tutorial on the adafruit website that is probably the best start, but you'll have to do some searching on your own to fill in the blanks. It has 2 pins for an external crystal, (up to 20Mhz) or you can use its 8Mhz internal one. Notice that this is not Arduino compatible out-of-the-box, you will need to get some files to make it work, but once you do that, its just very easy to setup. We have done a small project using one of those chips and it just works great. Check our GitHub files for the required files and how to setup the whole thing up. What is the frequency of the internal oscillator? You can set the CKSEL fuse bits to run at 16MHz from the internal oscillator. See page 27 of the datasheet. i clocked mine to 8mhz on the internal oscillator. but you could run it up to 20mhz with an external crystal (at least thats what i read in the datasheet). You can use one but you lose one of the I/O pins. It can run up to 16Mhz without one so there's no real advantage to an external crystal. It can have a crystal. Look at the XTAL pins. Does this chip have UART? No, but you can fake it by shifting bytes out with the USI peripheral and precise timing (driving the USI with a hardware timer is one option.) Note that you will have to flip the bits of the byte you wish to send or receive. This technique is tricky - see Atmel App Note AVR307 for details. 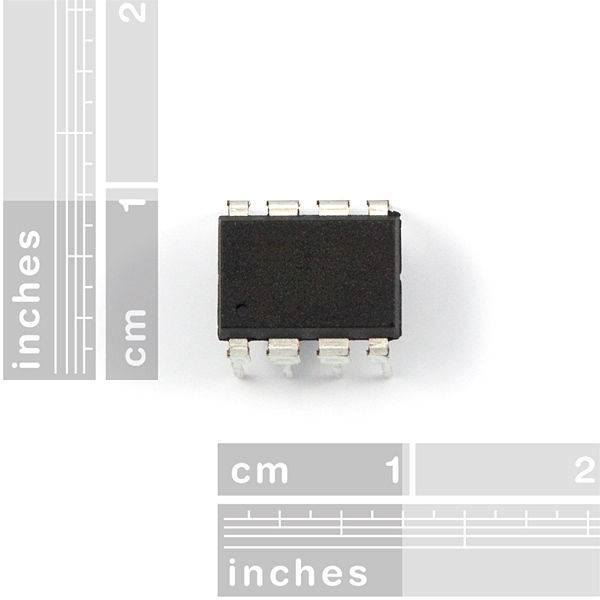 If you want a cheap and simple AVR chip with UART, get the Tiny2313. It only has 2K of Flash, so keep your code simple. If that's too limiting, go for the venerable Mega48 or '88, which cost the same or less than this chip. The Mega328 is pin-compatible with the '48 and '88 and SparkFun sells it. The main reason people use ATtinys is because they are small, giving the example of the 48/88 doesn't help those of use that use Attinys for their small size and ease of use. Or the 4313. Same chip w/ twice the space. Is this the ATtiny85 or ATtiny85v? The datasheet says the ATtiny85v will run at 1.8v but the ATtiny85 will only run at a minimum of 2.7v. I think it has to be the non V version as on the data sheet on the first page says only the non V version can go to 20MHz. Can this processor output PWM? Can the arduino bootloader be put onto it? I really need a cheap alternative to the ATmega328 ad I hope this is it. * Megas have a multiply instruction - Tinys have to emulate this in software too. SparkFun has no reason to stock a lesser version of the '328 but you can get them at prices approaching US$1.50 each at Digi-Key and other big suppliers. That said, the Tiny25/45/85 have a special feature that the Mega48-328 don't, which is a programmable PLL that lets them run the PWM clock at a whopping 64MHz (undivided, check datasheet for specifics) and they can run the CPU clock from the PLL too, netting the ability to run at > 16MHz with no external oscillator! Yeah, you can put the bootloader on it. See the link below. It is a slightly different version but you can still use the same commands. I'm not sure if you can get the bootloader on them, but they have enough space for it. Great info here. I'm new to Arduino and was starting to realize that each Arduino project will require an Arduino ($$$). It's nice to know that once I've got my project going I can dump it (i.e. shoehorn) onto something a much cheaper chip. Thanks all. Im hoping to create an ATtiny programmer as well as use two of them for a key lock mechanism thingy. Just want to check the voltage operation from the datasheet. It will work at anything between 1.8V and 5.5V? I'm going to be running a larger battery on one for long time but watch batteries for the other. yes, the ATTinys are quite flexible with power. For good (and safe) measure though, I would pair it with a suitable voltage regulator..
Just a heads up for those using this part, you'll want to make your own component in Eagle. The ATTiny45 in the SFEagle library has the pin assignments mixed up (as of 09-15-2009). 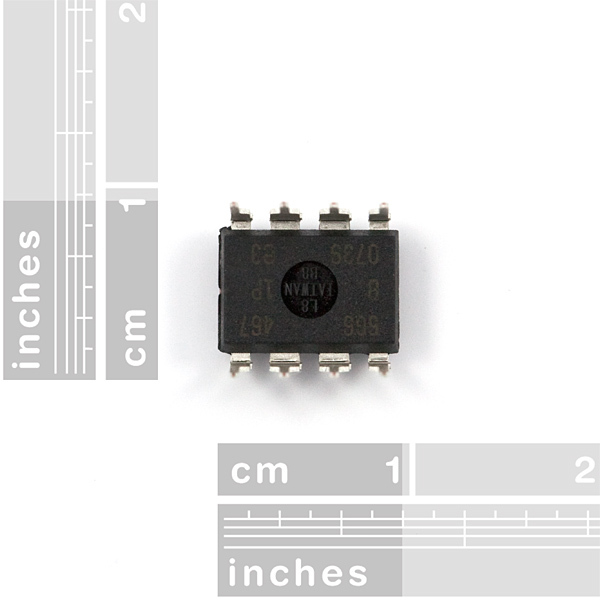 As a workaround you might use the ATTINY13 (seems to have the same pinout as the ATTINY25/45/85 and the DIP package is available). I just made a new part in eagle. As long as you can find an identical package it is very easy to do. just look at it; sitting there next to that giant quarter. being all...programmable...and stuff. AVR programmer required. Other than that, it'll do simple tasks on the cheap. Certainly the best size to efficiency ratio for such a chip! I have many projects which I was originally intending to be run by an Arduino. The problem: these projects use very few I/O pins/program space and even the smallest/cheapest Arduino boards (i looked at cheap chinese knockoffs of the Arduino mini) are too big and expensive. This chip has perfectly fit my needs! A problem with many microcontrollers are that they are big. they have too many i/o pins and features while in reality all you may want to do is simply control a few things. It is a waste. I'm using this s an i2c slave for a home made rotary encoder. So far so good! It was a breeze to prototype when used with another "Arduino as ISP". Very happy that I had one on hand, and surprised at how robust it seems. Can't wait to find more uses for this tiny thing. When you need low footprint, cost effective Prototyping on mini breadboard or need to build a project with one or two sensors/LEDs/loads @Tiny 85 is the best. 8k is not low enough space for programming, using SPI/I2C, LCD/7 Seg display can be interfered. With one ADC channel, multiple switches can be interfered too. 8k is enough to hold codes for doing these things. No worries !! there is a hiden world beside the arduino main stream, you can personalise it ! A BIT hard for begginners trough... I love it ! I used this MCU in a project to mimic a device in Left 4 Dead/Left 4 Dead 2 for a Zombie Crawl. Worked like a charm, and using the AVR Programmer made it easy.